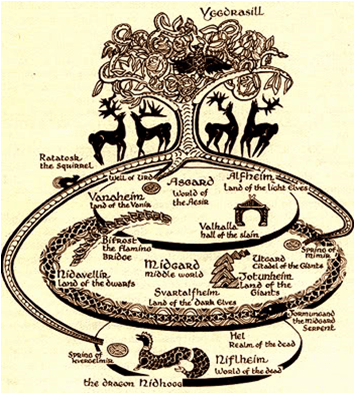 Norse Cosmology contains ‘nine homeworlds’ (Níu Heimar in Old Norse) in which all beings inhabit. 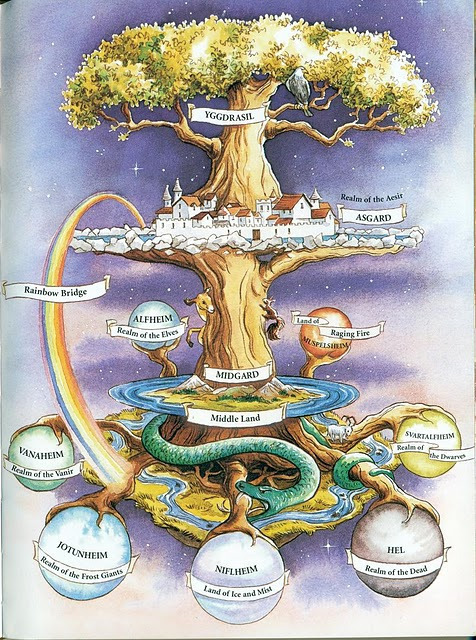 These worlds are centered on the World Tree, Yggdrasil, which lies at the centre of the cosmos. 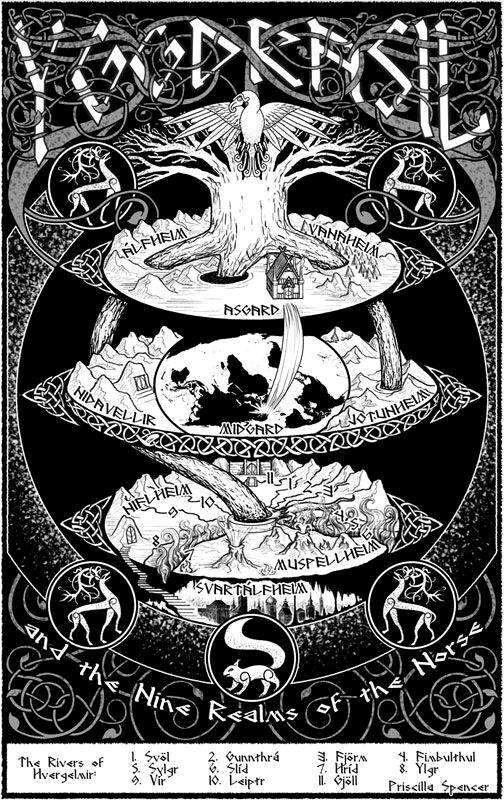 Each of these Nine Worlds is the homeland of various classes of beings that are part of Norse and Germanic mythology. Travel between the worlds are described in myths, where gods and other beings sometimes interact directly with humans. High in the sky lies Asgard, home to the Aesir, the sky gods. Asgard was also the home of Odin’s Valhalla and Freya’s Fólkvangr, where brave Viking warriors would go after death. Home of Urdarbrunnr, the Well of Fate, guarded by the Norns. A mysterious place, home of the Vanir earth gods. Home of Njord, Freya and Freyr, who came to live in Asgard after the Aesir-Vanir war. Next to Asgard in the heavens was Alfheim, home to beautiful elves, the gods of nature and fertility. Alfheim was ruled by Freyr. Home of mankind, also known as ‘middle earth’. Midgard was connected to Asgard by Bifrost, the Rainbow Bridge. Home of the jotuns (giants), enemies of the Aesir. Jotunheim was mostly rocks, wilderness and dense forests. Loki came from Jotunheim, later to live in Asgard. Home of Mímisbrunnr, the Well of Wisdom, guarded by Mimir. Deep in the underground lived the hideous dark elves, known to cause trouble to humans such as causing nightmares. They could not be touched by the sun, otherwise they would turn to stone. Similar to Svartalfheim was Nidavellir, where dwarves lived in caves underground. Ruled by Hreidmar, the dwarves were masters of craftsmanship and gave presents to the Aesir, such as Thor’s hammer and Odin’s spear. Could be the same as Svartalfheim. Muspelheim was a burning hot place created in the far south. It was home to the fire giants, fire demons, and the giant Surt, enemy to the Aesir. The lowest of the Nine Worlds, this land of ice and mist was located in the northern region of Ginnungagap. The oldest of three wells, Hvergelmir (‘Roaring Kettle’), was located here, which was the source of all cold rivers and the origin of all living things. Home of the Goddess Hel, daughter of Loki. When humans were not accepted to Valhalla or Fólkvangr, they came to Hel’s hall Elivdnir. Could be the same as Niflheim. This entry was posted in Pagan Blog Project and tagged norse, Pagan Blog Project, Wicca 101. Bookmark the permalink. Reblogged this on A World of Dreams.